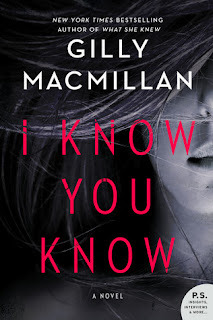 I Know You Know by Gilly Macmillan is a very highly recommended twisty thriller following two murder cases twenty years apart. A body is found in the same location where two young boys were murdered twenty years ago. Obviously the body has been there for awhile and is not a recent murder but while awaiting identification of the remains Det. Insp. John Fletcher recalls the case from years earlier as he was part of the investigation. In 1996 Charlie Paige, 10, and Scott Ashby, 11, were murdered in the city of Bristol, England, their bodies dumped near a dog racing track. Sidney Noyce, a mentally challenged adult was convicted of the killings. Now, in 2017, Noyce has committed suicide in prison. To complicate matters, Cody Swift, who was a friend of the two boys years ago, has decided to return to Bristol and look into the murder of his friends. Swift has a podcast he calls "It's Time To Tell" and he is questioning everyone involved with the case. He is hoping to find new evidence to prove Noyce was not guilty and, hopefully, actually find the person responsible for the murder of his best friends. Not everyone involved want the old case looked into again, but Swift is determined to interview people and play those interviews on his podcast. This is a very clever original murder mystery that is well-paced, entertaining, and an engrossing read. The chapters follow Fletcher in the current investigation and the older murder; a transcript of Swift's podcast; and Jess Paige, Charlie’s mother. It appears that some people don't want the old case reopened, but it must also be determined if the bones found are related to the 1996 case. Swift's podcast are raising old questions, and making people uncomfortable and even feel threatened. The development of the characters is excellent. Macmillian slowly revealed more and more of each character, their flaws and fears, while what felt like a potentially threatening situation grew. Secrets abound with all of the characters. No one is perfect; everyone could be hiding something. The writing and the presentation is pitch-perfect in this complicated, gripping mystery. The reader is presented with current information along with the story and investigation from twenty years ago and more details and new information is revealed. I was caught up with both stories and couldn't deduce what was true and what was self-serving. The pacing is perfect and the multiple points-of-view and the multiple time periods were both assets to the narrative. This novel should appeal to true crime readers as well as those who love a good twisty mystery/thriller.